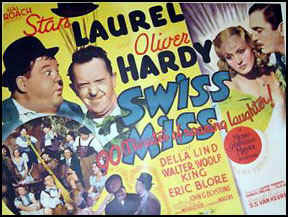 Two clueless mousetrap salesmen (Stan Laurel and Oliver Hardy) travel to Switzerland, where they are promptly relegated to working as dishwashers in a restaurant; meanwhile, Ollie (Hardy) falls for an opera diva (Della Lind) whose husband (Walter Woolf King) wants to be left alone in peace to compose. As Dave Kehr accurately points out in his Chicago Reader capsule review, this inane Laurel and Hardy flick is, quite simply, “one of their worst films.” The paper-thin subplot (involving Lind and King) makes little sense, and while Lind (nee Grete Natzler) is mildly charismatic (she hoped to make it big in Hollywood as the next Jeanette McDonald, but this was ultimately her last film), the songs she performs are insipid at best. Laurel and Hardy themselves aren’t given much of interest to do, either: the best known sight gag in the film — Stan and Ollie are forced to move a piano across a rickety bridge spanning the Alps — is simply a retread of their classic short “The Music Box” (1932); and when a man in a gorilla suit shows up as part of the “joke”, all hope for genuine chuckles is lost. The one mildly amusing sequence — involving Stan valiantly tricking a stoic St. Bernard into giving him his keg of brandy — is hardly funny enough to recommend sitting through the rest of this tedious film. No; there’s no reason for this clunker to be listed in Peary’s book.